The Sony Alpha A100 is a 10 megapixel DSLR (CCD) Camera which features Sony’s super steady Image Stabilization and Anti Dust technology also provides eye start auto focusing and a 2.5 inch LCD screen. The Sony Alpha A100 also features a continuous burst mode, which can capture JPEG images at 3 frames per second up to the limit of the flash memory card. 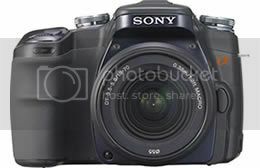 The Sony Alpha A100’s price with the 18-70mm lens is expected to be around $999.95 (USD) availability is currently unknown.